Historical Background of the Book. When Judah was initially conquered by the Babylonians in 606 B.C., a number of young men were taken back to Babylonia to be trained for service in the king's court. Some of these rose to positions of considerable power and influence. However, the mighty Babylonian Empire was very short lived. Only about 50 years after the Babylonians destroyed Jerusalem in 586 B.C., they were being conquered in turn by the Medeo-Persian Empire under King Cyrus around 540 B.C. As described in the book of Ezra and later in the book of Nehemiah, the Medeo-Persian Empire was favorably inclined toward the Jews and let a number of them return to the land of Canaan beginning around 539 B.C. to rebuild the temple and Jerusalem. The Author and the Audience. One of the Hebrew youths taken captive to Babylonia was Daniel. From 606 B.C. to 535 B.C., he would serve both the Babylonian Empire and later the Medeo-Persian Empire as both a government official as well as a messenger from God. Outline/Major Themes. In the book of Daniel, we see glimpses into the majesty and sinful pride of King Nebuchadnezzar as well as his son, Belshazzar. The book is mostly a historical account with interspersed visions and prophecies. Ch. 4 Nebuchadnezzar's dream of the Great Tree, his sinful pride, fall, and repentance. 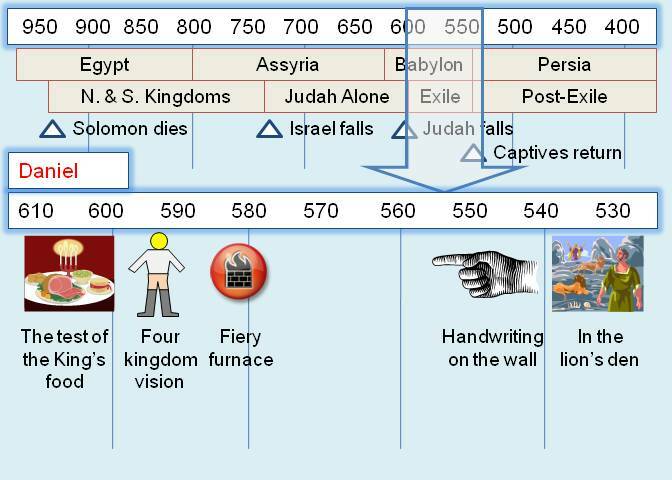 Four beasts - The rise of world empires (Babylon, Medo-Persia, Greece, and Rome), the coming of the "Son of Man" (Christ), and His Kingdom. 70 Weeks - Daniel's prayer for his people, a visit from the angel Gabriel, the decree to rebuild Jerusalem (445 B.C. ), the coming & death of an Anointed One, and the desecration/destruction of the temple (Some scholars cite fulfillment in the Maccabee revolt and temple desecration in 165 B.C., but many others see the coming of Christ around 30 A.D. and subsequent destruction of the temple & Jerusalem by the Romans). Messages for Christians. Daniel's experiences provide several lessons for Christians today. Put God first and take a stand for Truth - When young and far from home, if it costs your job, or even if threatened with certain death (Matt. 6:24-34; Matt. 13:7, 22).